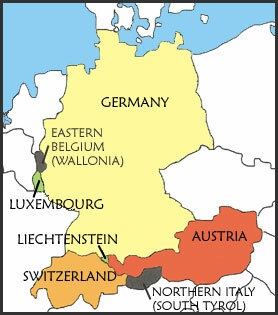 German is the official language of Germany, Austria, and Liechtenstein. In addition, it is one of four official languages in Switzerland, and one of three commonly used in Luxembourg. There are over 120 million native speakers of German, primarily in Europe, though it is spoken regionally by native speaker minorities in 40 countries. As an international language of business, scientific research, publishing and tourism, it's estimated that German is spoken as a foreign language by an additional 80 million people worldwide. Christmas in Germany: How do the Germans celebrate Christmas? You'll be surprised to find out how many of their traditions were exported all over the world, from Advent calendars, to Santa Claus, to Christmas trees. Also, learn about German Christmas foods, find recipes, and listen and sing some German Christmas carols. Why learn German? : 12 excellent reasons why you should be learning German. German children's songs: Kinderlieder provide a fun and easy way to internalize language and get to know German-speaking culture. German grammar explained: Clear, thorough and up-to-date explanations of the main features of German grammar. Most common German words: Discover the top 100 words in the German language, plus the 25 most frequently used nouns, verbs, adjectives, adverbs, and more. Common German beginner mistakes: 10 of the most common errors made by beginning learners of German and how to avoid them. Oktoberfest: What is Oktoberfest and how did it all begin? Why is Oktoberfest in September? How much will a beer cost me this year? Where can I get stuff to put on my very own Oktoberfest bash? All these questions answered and more, plus listen to some Bavarian oompah music samples. German practice activities: Beginner I | Beginner II | Interactive vocabulary and grammar practice activities and lots of supplementary German grammar explanations and cultural information, especially for beginners. How to type German special characters: How to type German umlauts and the ß in Windows, Mac, and HTML formats. Free German fonts: Download free German scripts, including Fraktur, Sütterlin, Gothic and more. For Windows or Mac. German textbooks: The most commonly used college-level German textbooks for all levels of German from beginner to advanced, including books for courses in German language, literature, culture, business, and reading knowledge. Online reference tools: Links to the best German online dictionaries, translators, verb conjugators, grammar explanations, free online German courses, and much, much more. Mark Twain's "The Awful German Language": Learners of German will appreciate Twain's sarcasm on his struggles with learning German and his humorous observations about the German language. German film: From the silent film era to modern-day Hollywood, German speakers have played a significant role in international cinema history. German books: Grammar & language reference books, dictionaries, books on German-speaking culture & business, travel, cookbooks, and more. German magazines & newspapers: Most German-language print media are available free online. Many can also be acquired through print subscriptions. German links: The best online resources for German language and culture. German books and magazines for all ages and interests. The hottest German music & German movies. Oktoberfest goodies, from music to mugs, authentic Bavarian sausage, posters, and more. Host your own website at Bluehost.com.